The Louisiana State exhibit was located in the south-western portion of the Government & States Building. 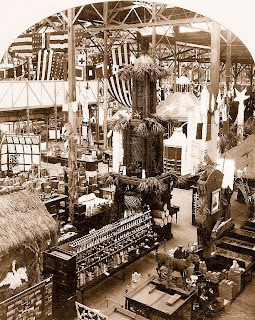 Covering an area of 9,805 square-feet, the host-state's comprehensive display featured a thirty-foot high tower, constructed of latticed sugar-cane, with palmetto fronds woven into branches at the corners. 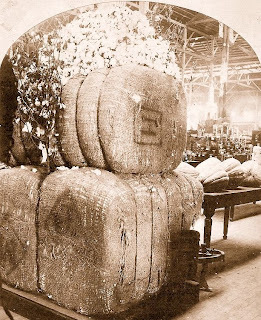 Aisles around the tower were decorated with Spanish-moss, cypress tree trunks, sugar-cane, and palmettos. 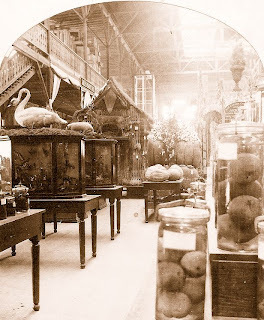 Along one of the main aisles was a display of rice, located within a canopy thatched with rice straw, supported on pillars of sugar-cane, and decorated with cotton and Spanish-moss. 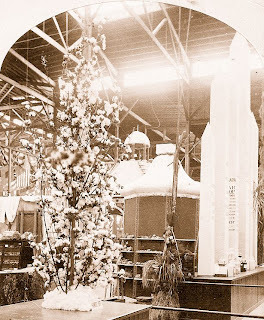 A pyramid of oranges was sheltered by a similar canopy; while large bales of cotton, decorated with bolls and branches of cotton plants, were stacked nearby. A leading feature of the Louisiana exhibit was the timber display, judged as one of the greatest in the Government & States Building. 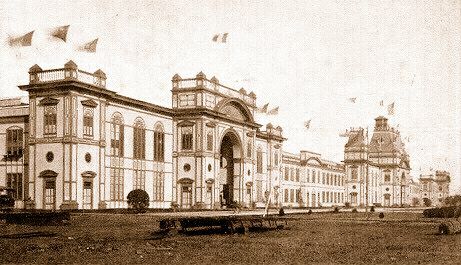 Additional exhibits consisted of minerals, soils, rock-salt, sugar, honey, grapes, tobacco, rice, and cotton. 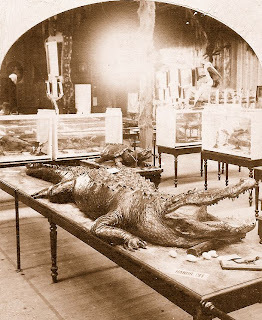 A large number of mounted birds, mammals, and reptiles were also displayed, including a fifteen-foot long stuffed alligator from Bayou LaFourche. 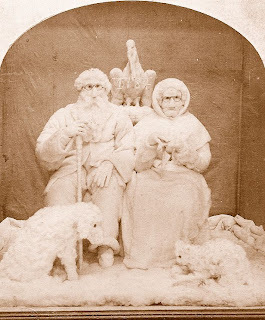 In a large glass case was an allegorical group, created entirely from cotton, featuring an elderly man and woman representing "King Cotton & Louisiana". Large obelisks of sugar and salt were displayed, showing the vast amounts of those products produced in the state. Over a large display of sugar-barrels, a sign proclaimed: "Only one-twentieth of the land in Louisiana available for sugar is now under cultivation", while another placard read: "Louisiana wants more men and women of brains, energy, and capital". A fine collection of Indian basketry, produced by the Chitimacha tribe from Bayou Teche, was exhibited among other native-Indian products. 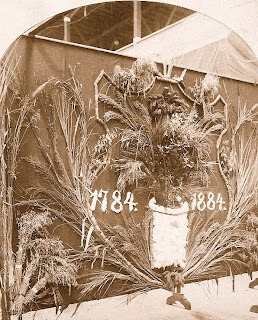 A large sign-board prominently displayed Louisiana's "Fruits of Prosperity", consisting of artistically-arranged samples of cotton, sugar-cane, rice, and other crops cultivated in the state during the previous one-hundred years.